Flintknapping, the art of making chipped stone tools, may have begun as much as three million years ago, when our ancestors began fabricating crude stone hand axes. Through the ages, stoneworking skills were refined, and eventually spread to all inhabited continents. In North America, the manufacture of chipped stone tools can be traced to the arrival of the "Clovis" people on the continent, about 12,000 years ago. The Clovis people (also referred to as Paleo-Indians) got their name from a site near Clovis, New Mexico where the first examples of their stone tools were found. Archeologists debate the date of first arrival of humans in North America, with some holding to the "Clovis First" theory, while others insist that people arrived here earlier. Either way, it is safe to say that when people first arrived in North America, they brought with them a sophisticated stone tool technology. Over the last 40 years, there has been a renewed interest in this ancient craft. Today "flintknappers" are found around the world. The word "flintknapper" most likely had its origin in the German language. When pronouncing this word in English, the "k" is silent, so the word is pronounced "flint-napper." When saying the word "knap" in German, the "k" is pronounced, and the word sounds like "ka-nap." The German word "verknappen" means to reduce something or to make less of something, and the German word "knacken" translates into "to crack," as in to crack a nut. Both cracking, and reducing a stone in size, pertain to the flintknapping process, since larger pieces of stone are reduced by chipping it into smaller finished pieces. At some point, probably during the era of flintlock weapons, this German word morphed into English, and those who produced gun flints for the King of England, became the Royal Flintknappers. Flintknapping begins with collecting rock suitable for the task. All stone used in flintknapping is high in silica content, and includes flint, chert and obsidian. These materials resemble glass to some extent, and break the way glass does, with a rounded or cone-like fracture. In fact, manmade glass is one of the best materials beginning flintknappers can use, because it is easy to obtain and easy to chip. Although the words flint and chert are often used interchangeably, they are slightly different types of stone. Chert is formed in limestone or shale formations, while true flint is formed in chalk beds. An example of prominent chalk beds can be seen in the coastal cliffs of Dover, England. Obsidian, or volcanic glass, is formed as a result of volcanic activity. There are no true flints or obsidian in New York, so we must content ourselves with chert. In his 1948 article in the Pennsylvania Archeologist entitled "Varieties and Sources of Flint found in New York State," Charles Foster Wray wrote that there were 17 different rock formations in New York that produced "flint." In 2004, John Holland, of the Buffalo Museum of Science, named approximately 95 different varieties of chert that could be found in the state. New York is rich in chert, with this material being found in formations in the Hudson and Mohawk Valleys, the Lake Champlain area, and around the shorelines of Lake Ontario. It is interesting to note that the Mohawks' preferred name for themselves is Ganienkheh, which translates into "People of the Flint." Some Native Americans mined their chert directly from rock outcrops in which it was found, while others collected it from streams and open places near streams, where it had been deposited by glacial or fluvial movement. Chert can still be collected from fields and streams today, but one should always obtain landowner permission prior to any collecting. After chert is collected, it must be broken into flakes called spalls. This reduction is usually done by hammering or "percussion flaking." Spalls are then made into arrow points, scrapers, drills, knife blades and spearheads through a combination of percussion and pressure flaking (described below), abrasion, and sometimes indirect percussion flaking. The tools for this work were primitive but effective. A basic aboriginal flintknapper's toolkit included hammer stones and antler billets (made from the heavy basal portion of an antler) for percussion flaking, abrading stones for grinding edges, and antler tines for pressure flaking. Some tool kits included antler punches for indirect percussion flaking. Finally, a heavy leather pad was used to protect the hand while pressure flaking. Percussion flaking is accomplished by striking the chert with a stone or heavy antler billet, thereby driving off a spall. Percussion is used to thin spalls and shape them into a "preform." The preform can later be worked into a finished knife blade or spear point. 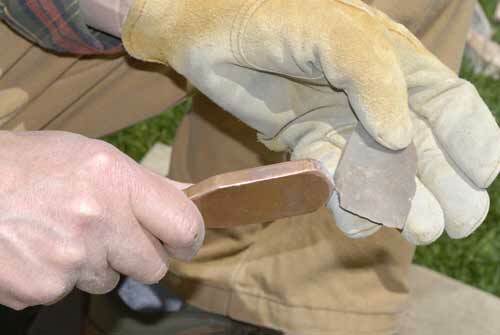 Pressure flaking-pushing smaller flakes off a spall or preform-is done to sharpen edges and create notches in the sides of projectile points so they may be hafted to arrow shafts or, in the case of knives, to handles. In order to remove a long flake, a striking platform must first be made on the edge of the spall. This is done with the sandstone abrader, by rubbing the sharp edge of the spall until it is somewhat flat and dull. Although many modern flintknappers still use traditional tools, others have replaced hammer stones and antler billets with copper billets, and antlers with copper wire tools for pressure flaking. In place of the leather hand pad, many knappers wear a glove. Modern knappers often prefer a grinding wheel over a sandstone abrader. Flintknapping is fun, but has its own element of danger. Working with sharp materials such as glass, flint, chert and obsidian can result in serious cuts if one is not careful. Knappers should always wear protective eye wear and gloves. Flintknapping is best done outdoors, or in a well ventilated room, since silica dust is a by-product of knapping and is unhealthy to breathe. Numerous books, video tapes, and DVDs are available to anyone interested in learning more about this ancient and interesting craft.